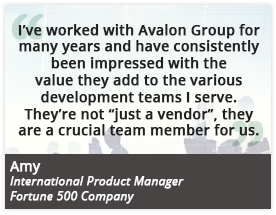 Avalon Group provides user interface design services for software products and devices with displays. Clear language, standardized terminology, and a focus on users’ needs are critical to usability. With software development increasingly moving offshore, it is essential to start your software project with a clear vision. By conducting usability studies and refining your user interface before you start the software development process, you can shorten your time to market and ensure a well-received product.